M4V Converter Plus convert the protected iTunes M4V videos to unprotected videos, and then can be played anywhere without the limitations of 5 devices. All the converted is to your private uses legally. The profile displays a variety of mobile devices, and each device has one or more popular output formats such as mov, mp4, avi, flv, swf, 3gp and so on, and it shows the profiles which you used recently. In addition, you can set a different profile for each file. Tips: To set all the files into the same profile, you can check the option Apply to All, or select all the files(Alt+A) then choose the profile you want. Each profile has its own default profile setting, but you can customize the parameters according to your need. Video Codec: The way of coding video. Video Size: Size of the video window. Some profiles provide several video sizes for you to choose. Video Bitrate: The way to determine video quality. Audio Codec: The way of coding audio. Audio Channel: Audio Channel has two choices, Stereo and Mono. Audio Bitrate: The way to determine audio quality. Step1: Choose an output format in the profile list. 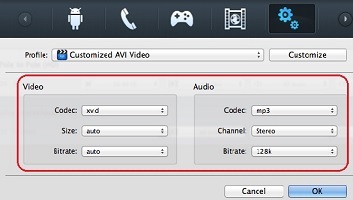 Step2: Set the Video Codec, Video Size, Video Bitrate, Audio Codec, Audio Channel, Audio Bitrate as you need. Step3: Click the Customize button, and choose the option Save Current Profile, then a confirm window will pop up. Step4: Input the title and the description of the new profile, and click the button OK, then the new profile is saved. Tips: After successfully added the profile, you can click the button Customize to rename or delete it. After you open the converting box, the default option is Open folder when conversion completed. Open folder when conversion completed: If checked, after all the files converted, it will open the output path. Shutdown your mac when conversion completed: If checked, after all the files converted, your mac will be shut down.